Red raspberries are a real menace in savanna restorations. Once the habitat is opened up, they flourish in the increased sunlight. I did a literature review and discovered that red raspberry seeds will survive many years in the soil. The longest with hard data was 100 years, which, as far as we are concerned, is infinite. Although blackberries and black raspberries can be mostly eradicated by cutting and herbicide treatment of the cut stems, this does not work with red raspberries. They are fiercely clonal, and make dense stands. Cutting and treating is useless. Last year I developed a new procedure. After all the stems were top-killed by a burn, they resprout at the base. At each stem there is a rosette of new growth. As soon as these rosettes are large enough, they were sprayed with Garlon 3A (foliar concentration). The rosettes were rapidly killed. However, not all the stems resprout at the same time, so it is necessary to return and spray the new rosettes two weeks later. And finally, a third spraying to get all the stragglers. In marked patches, I found that this procedure eradicated the clone without too much negative effect on the "good" species. Time consuming and expensive, but hopefully worth it. I am making a series of photos of prairie and savanna seedlings at an early stage of growth. There seem to be few such photos available in the literature. Recognizing good and bad plants at an early stage is really important in managing a restoration. 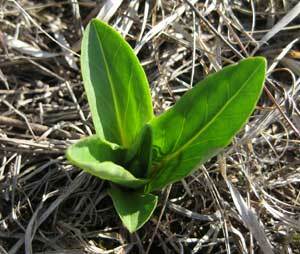 The photo is of a shooting star seedling (Dodecatheon meadii). Today the weather really cooperated and we were able to finish our savanna burns and complete our burns for the year. With the cold, wet spring, I had given up hope of getting all our burns in, but patience was rewarded. After the spotty results of last Thursday (see post of 4/17/08), the results for this Monday were all one could ask for. 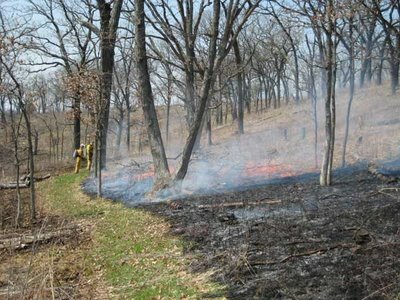 We were able to burn virtually all of our bur oak savannas (Units 8, 10, 11A, B, and C, 12B, and 19. These are all the units in the ridge-top savanna. Check the management map for locations. The weather was warm (70-80 F) and the humidity fairly low (35-30%). The wind was out of the southwest at 5-10 mph, with a few gusts to 11-12 mph (perfect). The dry conditions were needed, but it was the wind that made our day. It pushed our fire uphill at a vigorous but not too vigorous rate. We have never had such good burns in our savanna. We had a crew of 9, all experienced burners.